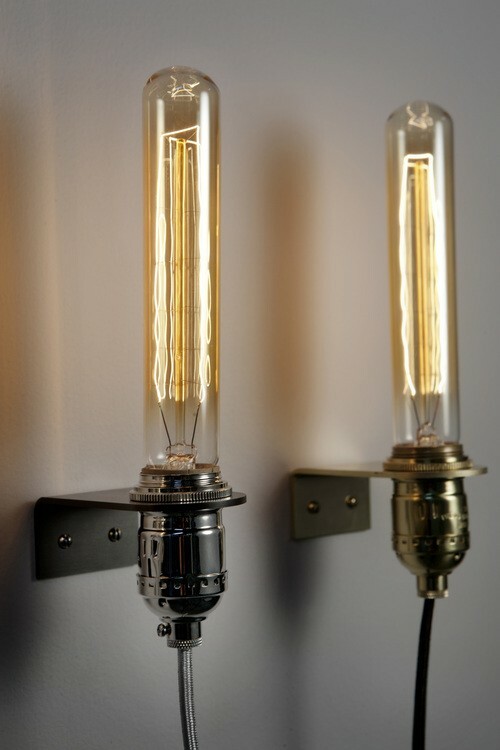 No way to hard wire a sconce, but really want one? I have the answer in the new Last Minute Sconce #1. Simple attached the socket bracket and wire guides to the wall, plug it in and away we go! The socket bracket is .125″ steel finished in Natural Black, Brown Patina, White and Brass or Nickel plate. Sockets are either brass or nickel. Sounds complicated, but it’s easy! To turn the light on and off there is a inline switch on the cord. Cords are all black and drape slightly depending on mounting height.